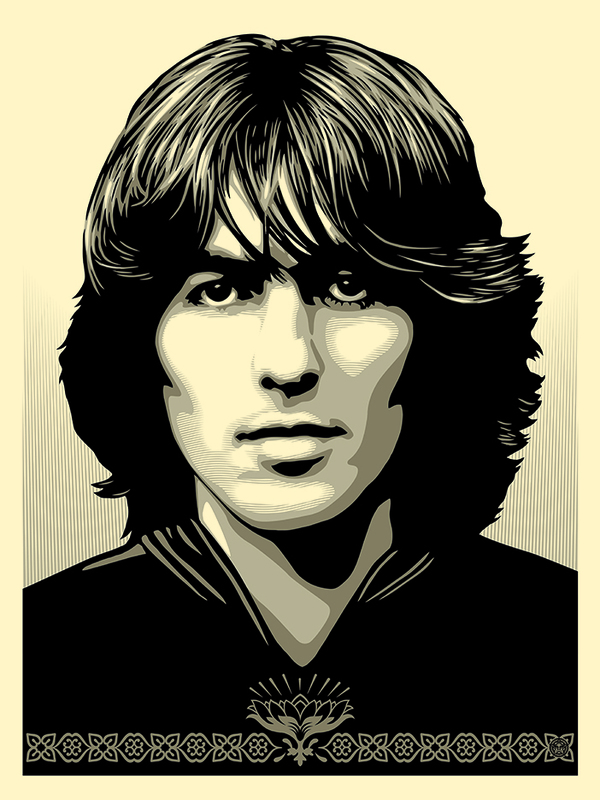 I was honored to be asked by Dhani and Olivia Harrison to work on a portrait poster to coincide with the major reissue of George Harrison’s first six solo albums, released between 1968 and 1975 on The Beatles’ Apple Records label, digitally remastered from the original analogue masters. The Apple Years 1968-75 will be available on CD and digitally on September 22. Designed to complement Harrison’s 2004 collection, The Dark Horse Years 1976-92, the new box features an exclusive DVD with several video pieces, including a new seven-minute film with previously unreleased footage. The Apple Years box also includes an exclusive perfect-bound book with an introduction by Dhani Harrison, new essays by award-winning radio producer and author Kevin Howlett, and rare and previously unpublished images. 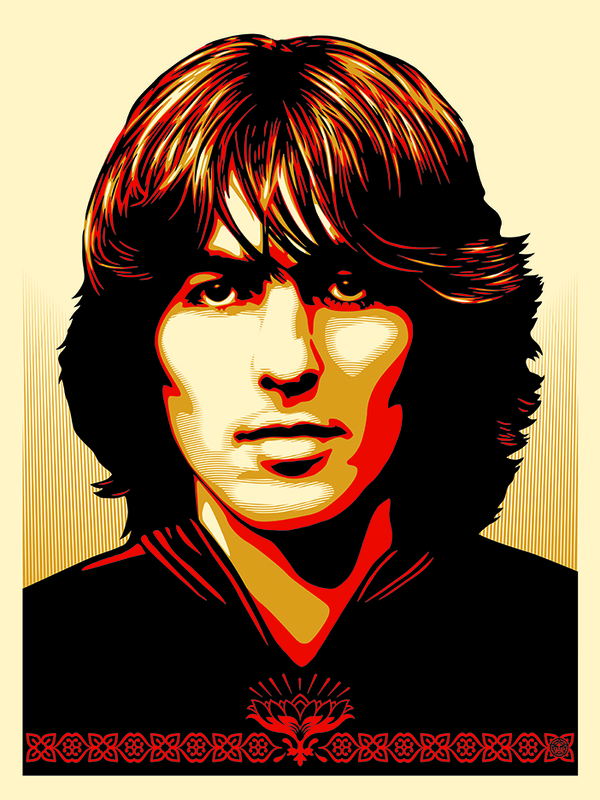 Poster For George will be offered in two editions, Red, and Silver. Both editions limited to 400 signed and numbered copies. Red edition available from Obey Giant web store on 10/23/14 at a random time between 10am and 12pm PST. 1 per household/person. Silver edition to be released 10/24/14 through the George Harrison estate web store at 10am PST located here. My parents were Beatles fans and introduced me to them at a young age. In college I grew to especially love the later Beatles albums like Sgt. Peppers, The White Album, and Abbey Road. George Harrison started to contribute more songs to the later Beatles albums that were just as strong as any Lennon-McCartney compositions. I got George Harrison’s “All Things Must Pass” album a long time ago, but even as a kid listening to the radio I reacted very emotionally to the song “My Sweet Lord”. The song has a profound beauty and melancholy that is unique and powerful. I love George’s solo material musically, but what speaks to me most about George’s music and actions is his humanity and his soulfulness. When I say soulfulness I don’t mean his music sounds like soul music, even though I know that he was a fan of soul music, what I mean is that his music addresses the full spectrum of human emotions honestly. 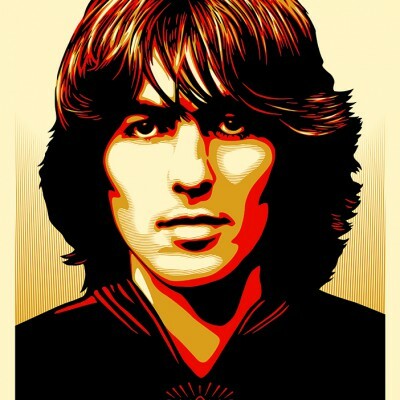 I think George looked at himself as a world citizen, and not only brought international influences into his music, but was sensitive to human rights and politics around the globe. I’ve always seen music and art as amazing pleasures, but also as relatable vehicles to deliver a point of view. Art and music can invite people to think about something they might ordinarily not be interested in. George put together the Concert For Bangladesh as a way of using his music to benefit humanity. I admire that he went beyond just writing songs addressing issues, and used his significant cultural weight to be an activist and put something noteworthy together, both as a way of raising money for Bangladesh, and of publicizing the situation there. George is a hero. Print will be offered in two editions, Red, and Silver to be released at separate times. Please see specific release information for each print below. 18×24” Screen Print, Signed and Numbered Color Edition of 400. $65 each, limit 1 per person/household. Release date: 10/23/14 at a random time between 10am and 12noon PST through Obey giant web store here. 18×24” Screen Print, Signed and Numbered Silver Edition of 400. $65 each, limit 1 per person/household.